"Super Science High Schools (SSHs)" are upper secondary schools designated by Ministry of Education, Culture, Sports, Science and Technology (MEXT) to carry out research and development with emphasis on science, technology, and mathematics for the purpose of developing internationally minded human resources in the fields of science and technology, based on the project started from the 2002 fiscal year. This issue picks up one of those SSHs, "Hyogo Prefectural Kakogawa Higashi High School", with special focus on "KAKOGAWA Design Drawn by Higashi High School Students" Group in the General Science (GS) Course that has pursued research on a given subject. 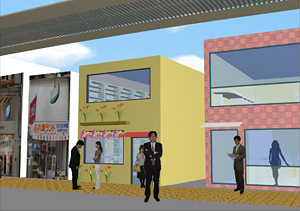 A massive amount of wisdom is assembled in a town, which should originally be the place where various problems can be solved窶ｦ Based on such a point of view, the Group has been active throughout 2007 - 2008 fiscal years with a research subject of "What is town planning suitable for Kakogawa like?" 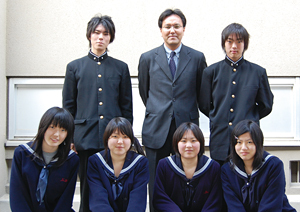 Mr. Hitoshi Takeuchi, academic and career counseling director and teacher of the School took care of the Group. Besides, Tomohiro Fukuda, Associate Professor of Environmental Design, Sustainable Energy & Environmental Engineering, Graduate School of Osaka University has been supporting the activity. 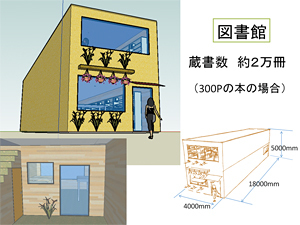 This was realized in the context that those two were old friends and that Prof. Fukuda's approach to environmental design using 3 dimensional (3D) CG and VR (virtual reality) were convinced to be very effective in the subject research. Indeed, in actualizing the plan, it was decided to incorporate 3D VR technology to use as a base according to Prof. Tomohiro Fukuda's suggestion. As a tool to generate 3D VR spaces, to carry out simulation of different proposals, and to make presentations of the generated data, a 3D real-time VR software product of FORUM8 "UC-win/Road" was adopted. We interviewed Prof. Tomohiro Fukuda, Mr. Hitoshi Takeuchi, and the members of the Group. 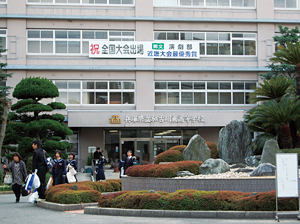 Hyogo Prefectural Kakogawa Higashi High School is known as one of the best high schools oriented toward preparation for university entrance examinations in the prefecture. Its predecessor, Kakogawa Higashi Junior High School was founded in 1924 under the prewar education system. The educational reform made it changed into the present organization maintained since 1948. Reflecting the tendency of the students of the School towards desiring to go on to 4-year national or public universities and that more than half of them are science students, the science and mathematics course was established in 1986 in addition to the regular course. In 2003, the science and mathematics course was reorganized into the aforementioned "GS Course" for the purpose of promoting search for natural science through voluntary activity of subject research as well as educational activity in cooperation with universities and research institutions and developing the students' ability and aptitudes for this. Not only science and mathematics but also English have been emphasized as key subjects aiming at developing human resources who can demonstrate leadership in an international society to the fullest. In this context, the School obtained designation of "SSH" from NEXT in the 2006 fiscal year (for 5 years of designation period). Taking advantage of this opportunity, the School held up a slogan, "From KAKO to the Future" with the word "KAKO" meaning "Kakogawa" and "the Past". In concrete, the slogan means that the school promotes research and development with GS Course as its core based on 1) training students who have highly advanced knowledge of natural science along with ability to explore and study voluntarily and originality to create something new, 2) cooperation with communities and regional business, 3) training students who have ethical viewpoints, 4) training internationally-minded students, and 5) assisting club activities in the scientific field. One of these approaches to research and development is "subject research". Utilizing "general learning" classes for the 1st and 2nd grades of GS course (40 students for each grade), it has been implemented in small groups (about 5 members for each group). Each group is attended by "Regional Advisors" consisting of researchers and engineers in the region who are familiar with science, in addition to the assigned teachers of the School. It is so organized that both advisors and teachers are to guide the students in cooperation. Each group is supposed to work on the same research subject for 2 years continuously. 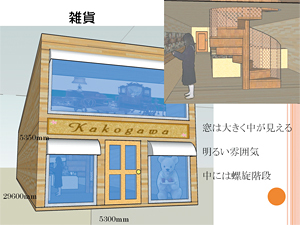 "KAKOGAWA Design Drawn by Higashi High School Students", the subject featured in this article, was developed throughout the 2007-2008 fiscal years. The Story Behind Grappling with Subject Research "KAKOGAWA Design"
As their individual motives, the students of GS Course who took part in the subject research of the Group (currently the 3rd graders) listed up expectation towards possibilities brought about by design, or their interest in environmental design. However, they mostly indicated that it was rather taking on the unknown, and especially it was the first time for most of the students to handle CG and VR that were used as tools. On the other hand, Associate Professor Tomohiro Fukuda, who is a graduate of the School, also participated in the SSH working and steering committee that provided guidance, advice, and evaluation from a professional point of view about the whole SSH program of the School. In addition, about the time of designation of SSH, he gave a lecture on his own activities for his junior students. Under such circumstances, he came up with a program that should give some insight into an advanced approach to environmental design with their local town Kakogawa as its subject, following that Prof. Fukuda was asked to be a regional advisor for the research project "KAKOGAWA Design Drawn by Higashi High School Students", which Mr. Hitoshi Takeuchi took charge of. He put his hopes into this program that young people would take this occasion for turning their eyes to their own town with affection before they leave the town after graduating high school, as was often the case for there are few universities and work places around there. Also in that process, a framework of the approach was planned that students would make a field investigation in town on their own to find research subjects, use scientific technology such as CG and VR, and then make proposals. "When an image is rotating on a CAD screen, operations of trigonometric functions or matrices are conducted at an ultrahigh speed." Existing knowledge can be utilized by incorporating it into a computer like this. Regarding unknown knowledge, however, the students themselves must find it out and incorporate it there. In order to realize this, it was aimed to inform the students of the importance of studying subjects given in high school including mathematics and to have them actually feel it through using software such as VR, as Prof. Tomohiro Fukuda recalled. In October 2007, Substantial activity of "KAKOGAWA Design Drawn by Higashi High School Students" got started with 6 members of the 1st graders in GS course. At the beginning, they introduced themselves and worked on categorizing places around each member's home and the School into their favorite places and the ones that are not. Next, they conducted town walking for the purpose of grasping the present situation centering on the urban area of Kakogawa city twice in December and January next year (2008) with the rout changed. The results were not only put directly on a map but also summarized in an analog way using stickers. In addition, it was expressed in a digital way using the Google Map, all of which were organized as the product of the first fiscal year. 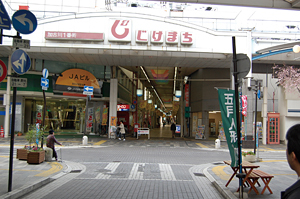 Through these tasks, in the 2nd year of the subject research, the target was focused on "Jikemachi Shopping Center". The shopping center is located in the central urban area close to JR Kakogawa Station, in which many of the stores have been shuttered in recent years, contrary to the adjacent Verde Mall that is relatively busy. 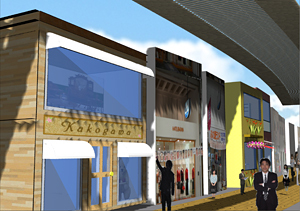 Being close to the School, it led to the concept of turning flow of people back to the shopping center, making the town come to life from the students' point of view. First, they made a map of 1/500, and plotted information of existing buildings or business types. Second, the students needed to complete the process from design to simulation and proposal on their own utilizing 3D VR technology within the limited time and budget for the subject research. Consequently, they adopted Google SketchUp Pro for generating 3D models while satisfying those conditions, GIMP (GNU Image Manipulation Program) for processing images, and UC-win/Road for simulating in various ways with 3D VR and making presentation with generated data, respectively. In August, they took an intensive one-day course of lectures on how to use UC-win/Road from a FORUM8 staff member. Then, they proceeded on learning the skill to use necessary software and generating 3D models for the present situation of Jikemachi under the guidance of Prof. Tomohiro Fukuda. In parallel with this, after brainstorming on the issues of Jikemachi Shopping Center, they used the KJ method to classify the results. Then, they narrowed down the items from different points of view, for example, the ones that were attractive and sustainable, or what the students thought "I want to do this kind of things" and "People may gather if this is done". Following the results, 6 members were assigned to their respective territories out of existing vacant stores so that they overwrapped each other within a 20-meter radius with mutual relationship. From December 2008 through early January 2009, each member designed individually a new building that would realize the function he or she paid attention to, including 1) a store for thick pancakes filled with sweet bean jam, purchasable while one is riding on a bicycle, 2) a multi-storey bicycle park, 3) a club with live music, 4) a variety shop, 5) a library, 6) a rest area, using Google SketchUp Pro. The individual models created were exported into UC-win/Road one by one, and they kept on elaborating the details of each model such as a building and people until immediately before the presentation. Mr. Hitoshi Takeuchi (Teacher) and the Group Members of "KAKOGAWA Design drawn by Higashi High School Students"
"KAKOGAWA Design drawn by Higashi High School Students"
On February 4, a program was held for 8 groups in the class (GS Course) to make presentations. On this occasion, the KAKOGAWA Design Group edited an animation work of about 2 minutes with VR data for explaining on PowerPoint. Subsequently, the Group also made a presentation on the research product in a poster session representing the school in the "Science Fair in Hyogo (joint program of presentations)" held on February 7 at Hyogo Prefectural Kobe High School. In addition, at the SSH research presentation program held on February 18, while all the groups (18 groups in the 1st and 2nd grades altogether) joined the poster session, the Group was chosen as one of the 5 groups allowed to make a presentation. Mr. Takeuchi emphasizes the advantage of VR, saying that they were able to demonstrate the design proposals effectively through using VR in the presentation within limited time. Besides, he realized once again the potential of VR technology as well as the quickness of high school students to learn how to use software. With the software products purchased and a certain degree of knowledge obtained, he desires to explore effective ways of applying them to other subject research projects. Prof. Tomohiro Fukuda says that in this subject research, it was hard to judge how much he could expect time (burden) on the students' side and how far he should guide the students while aiming to encourage their voluntary research. Moreover, he was uncertain about how much understanding and cooperation could be offered by the staff in charge on the School's side whose specialty was not town planning. In practice, though, their very flexible and positive response has led to good results, as he recalls.